Real-time access to a high quality, permission-based, national email address file with over 198 million unique email addresses. 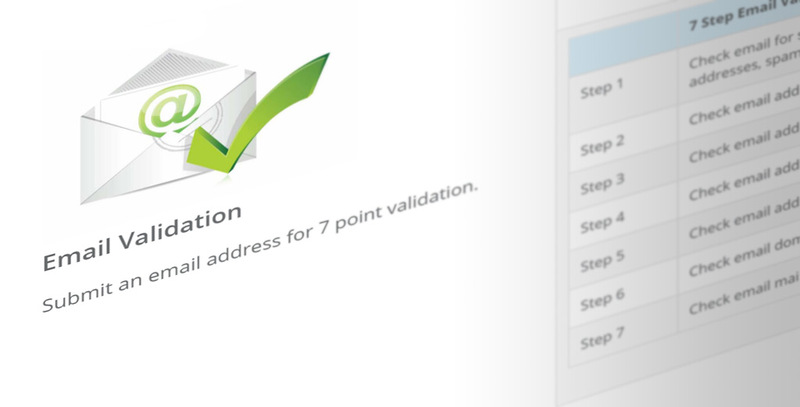 7 step email validation process can attempt to correct any errors and return a validated email address. Speed-to-market and information accuracy are critical to your email marketing campaign’s success. The UpdateYourList.com DIY Portal allows you to instantly validate email addresses in your customer and prospect files in real-time to get the most out of your contact records. The validation process utilizes one of the largest repositories of email address with input records at over 2 billion. Proprietary and comprehensive 7-step process flags potential undeliverable email addresses, autocorrects syntactical errors, and identifies spam traps, complainers, and more. The email validation process returns a completely clean and validated list of email addresses. Step 1: Validate email address for general format or syntax errors and compare to internal database of known undeliverable email addresses, spam traps, etc.